Acatenango is a stratovolcano in Guatemala, close to the city of Antigua. The volcano has two peaks, Pico Mayor (Highest Peak) and Yepocapa (3,880 m) which is also known as Tres Hermanas (Three Sisters). Acatenango is joined with Volcán de Fuego and collectively the volcano complex is known as La Horqueta. 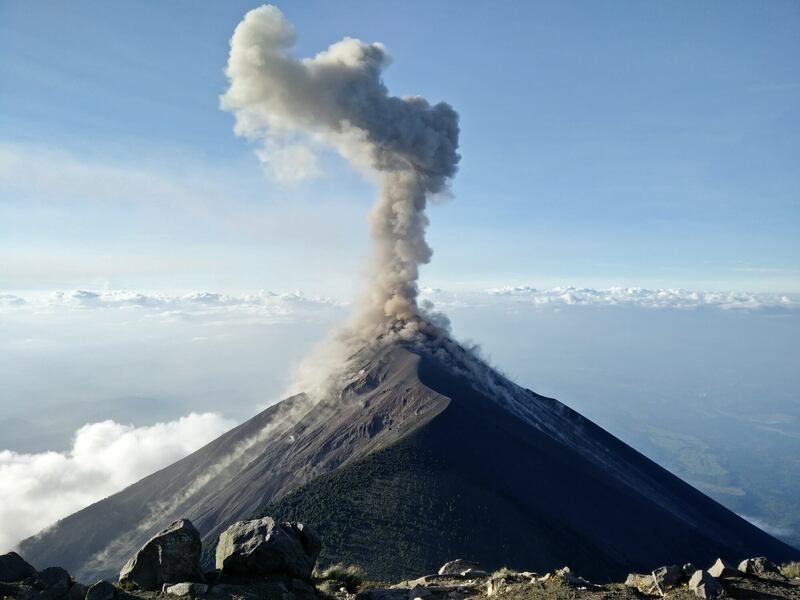 The Fuego-Acatenango massif comprises a string of five or more volcanic vents along a north-south trend that is perpendicular to that of the Central American Volcanic Arc in Guatemala. From north to south, known centres of volcanism are Ancient Acatenango, Yepocapa, Pico Mayor de Acatenango, Meseta, and Fuego. Volcanism along the trend stretches back more than 200,000 years. Although many of the centres have been active contemporaneously, there is a general sequence of younger volcanism, from north to south along the trend. This massive volcano complex towers more than 3,500 metres above the Pacific coastal plain to the south and 2,000 metres above the Guatemalan Highlands to the north. The volcano complex comprises remnants of multiple eruptive centres, which periodically have collapsed to form huge debris avalanches. The largest of these avalanches extended more than 50 kilometres from its source and covered more than 300 square kilometres. Volcán de Fuego ("Volcano of Fire") is an active stratovolcano in Guatemala, on the borders of Chimaltenango, Esquintla and Sacatepéquez departments. It sits about 16 kilometres (9.9 mi) to the west of the colonial city of Antigua Guatemala, one of Guatemala’s most famous tourist attractions. It has erupted frequently since the Spanish conquest. "Fuego" is famous for being almost constantly active at a low level. Smoke issues from its top daily, but larger eruptions are rare. On 9 August 2007 Fuego erupted spewing lava, rock and ash. 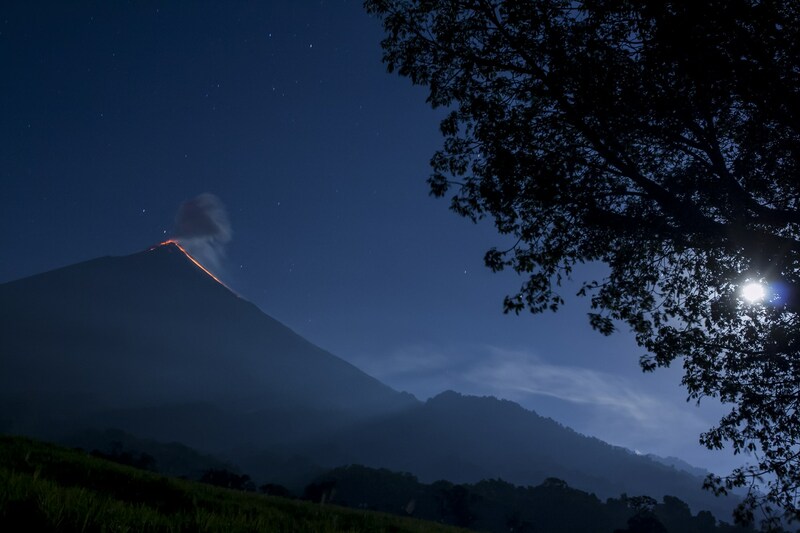 Guatemala's volcanology service reported that seven families were evacuated from their homes near the volcano. The volcano is joined with Acatenango and collectively the complex is known as La Horqueta. A new round of activity began on 19 May 2012, with lava flows and ejections of ash.